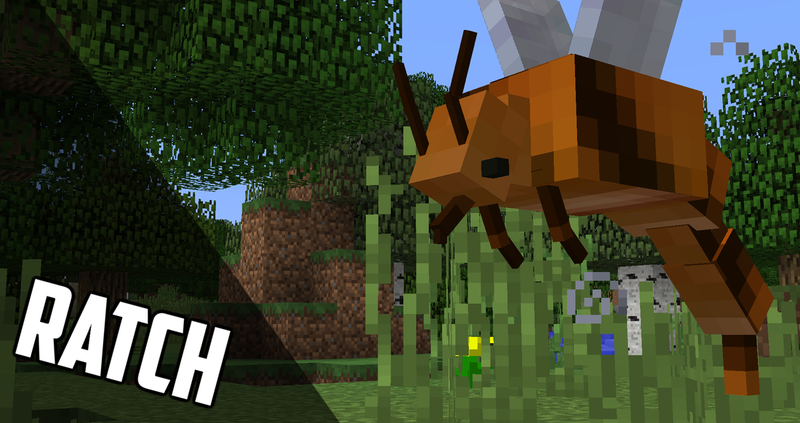 This is a Vanilla 1.11 Minecraft Command Block module which adds 20 new creatures to the game! It also includes a large variety of items and is constantly being updated. Check back for updates! Regular mobs have tweaked loot! This means previously useless mobs might catch your eye. Polar Bears now drop a lot of leather and wool. This is early in development and may be buggy. Please report everything to Jragon! Zombies, witches, endermen, and skeletons no longer spawn in the plains, forest, or caves unless there is a mob spawner. Creepers only spawn in forests and jungles. Spiders no longer spawn in the ice biomes. Silverfish spawn in the jungle. Cave spiders spawn in the jungle. 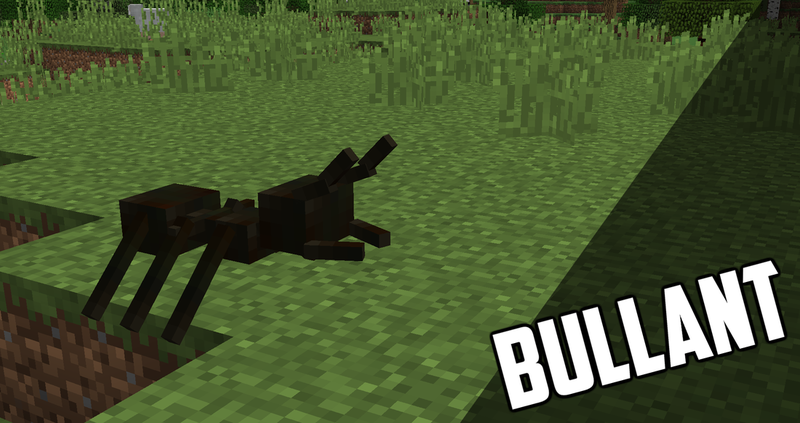 A tough beast found in the plains and forest biomes. It lurks for a meal. Do not let it near your base. It has destructive abilities, and has no trouble throwing you into the air. Bullants are mostly found in forest and plains biomes. Ants will only attack you if you disturb their colony. The Ratch cannot fly very well. Nor is it any good at fighting. Mostly found in the forest and plains. Dwindlers were hunters sent on a mission they cannot remember. Forever roaming in the caves, looking for someone. Kept alive only by the weakest of magic. It is a mystery how the Havenwitchers escaped the nether. They were the last wave of the reckoning. Found now, only in the deepest caves. The Ore Dweller is the unfortunate result of an experiment which occurred during the reckoning. It is looking for something, unsure about the purpose of its existence. You can find them roaming in the caves. On death, it drops various metals and ores. The Wanderer is another creature which should have stayed in the nether. Once it gets near you, it will stop at nothing to trap you with it. 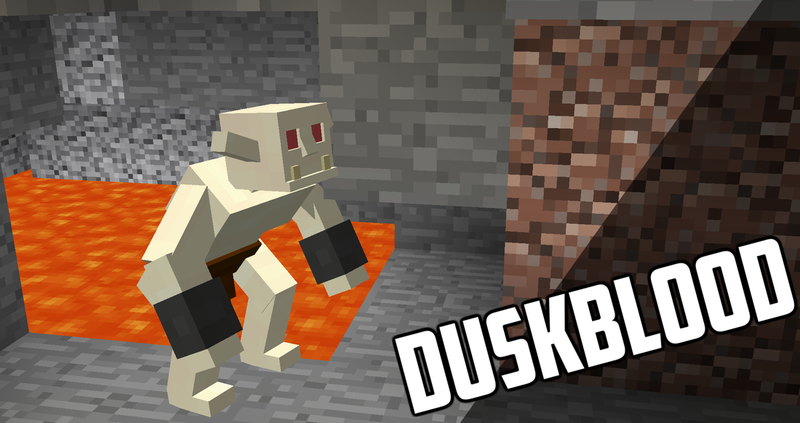 Duskbloods were once a civilized group of human beings. Under circumstances they had no control over, they became a cult, engaged in dark magic, and eventually turned into creatures which hide in the deep caves. The model was made by ItsZender. You can find his channel by clicking here. The Ent is a creature which will intends on destroying humanity. It will release spores which poison and sting you. Found in the oak forest, of course. On death, they drop various tree items. Inspired by the "Mo' Creatures" mod, the ogre is a forest beast which destroys anything in its way to feast on you. The model was made by ItsZeder. You can find his channel here. At first it may appear like a regular enderman. But this enderman strengthens undead mobs near it. It will remove torches too, so make sure you light up your house well, or use an alternate source of light, or go to a different biome. They also teleport the player around. On death, they drop a lot of Enderpearls! Only found in spruce forests. Inspired by Gamemode 4 and intially programmed by JustTheHat aka TPCBonehound. When zombies get cold, their vital organs freeze over, so they can withstand more impact. Glacers are creatures who have learned how to use the ice as a home. They were once vegetarian, but have since adapted to the taste of meat. The Mage sits around, waiting. Found only in Ice Structures, it was sent along with the Blights, Skitters, and Netherknights on a very important crusade. On death, the Mage drops the Mage's Staff which can be used to kill the wisps. Guardians of the snow, with a mission. Found only in Ice Structures. On death, they drop a ﻿Blight's Staff﻿. It is best killed by detonating TNT near it. Some skeletons are able to adapt to the desert climate. 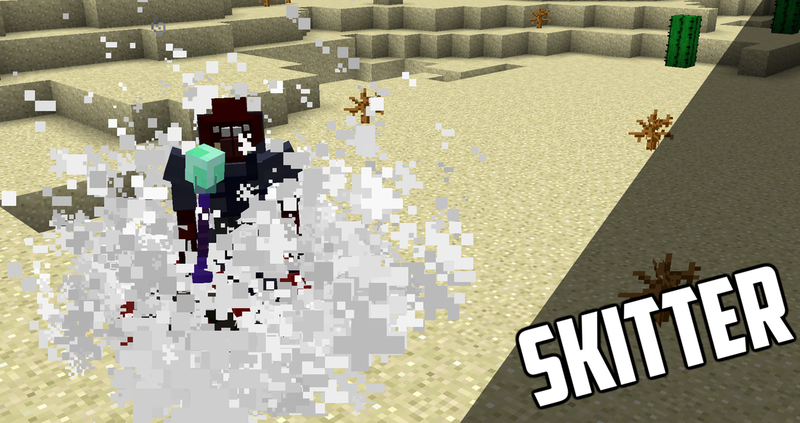 These particular skeletons are smarter, often referred to as "Sandskulls". Model by Mr Potato. Click here to see his channel. Scorpions are desert creatures with a VERY nasty sting. Keep your distance, and always keep a bucket of milk on you when trekking through the desert. Like the Mage, the Blight, and the Netherknight, the Skitter was once an established huntress, given only one goal. That goal is not known, but one day, it may become clear. Dark magic is what happens when a person is given nothing else to lose.​ It is best killed by detonating TNT near it. On death, it will drop the Skitter Staff. Model by ItsZender. Click here to see his channel. The Assassins aid the Skitters for equally unknown reasons. While they are not corrupted by dark magic, they do not fear working with it. 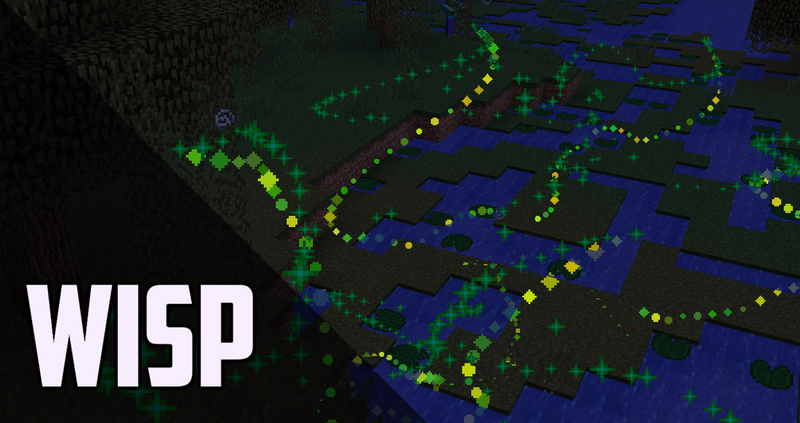 Wisps are energy sources which roam the swamps and rarely in the jungles. They can only be killed by using a Mage's Staff on them. They drop Dark Relics which are used to power staffs. Siccitas are flesh eating jungle beetles. Just like literally anything you may find in the jungle, with the exception of Ocelots, chickens, parrots, and... oh maybe it's not so bad there. The Netherknights were the last stand against the reckoning, sent in by the Monarch. Eventually the hopelessness of the Nether led them to insanity, turning them into what appear to be soulless beasts. No dark magic. No corruption. Just fear. They have a chance to drop a Netherknight Staff on death. Run away if you encounter one. Fast. Model by ItsZender. Click here to see his channel. The Lost for lack of a better name, are simply mutated and lost creatures. When a powerful being dies in the nether, their flesh becomes one with the terrain...leaving behind a mess of a creature. On death, they drop a Wanderer spawn egg. Deploy the Wanderer and kill it to set its being free once and for all. Model by Mr Potato. Click here to see his channel. Blue Decros - named after the Decree are closely related to Deadlocks and Strays. But with the intention to protect, and not the intention of killing. Found only in the Ice Structures. Deadlocks are closely related to the Blue Decros. They were sent out by the Monarch alongside other entities such as the Blight and the Mage to fulfil a mission. Even if that means murder. Found only in the Ice Structures. Found only in the Ice Structures. That's all we know. Strong. Fast. But easy to fight if you have a bow or shield. Model by ItsZender. Click here to see his channel. * this mob requires the custom structures module to be installed.